Troubleshooting the Harley-Davidson® electrical system can be a chore. Learn all about it here with these easy-to-understand videos. 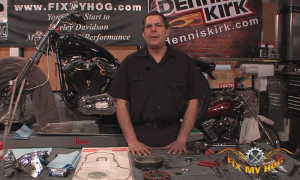 Our host, Bob LaRosa, will bring you back to school and review electricity and how it flows through our motorcycles. He does this to remove the “fear factor” when dealing with this system on your bike. When you finish this video set, you will no longer look at your electrical system as a bunch of wires. You will see the circuits and be able to attack any issue with confidence. 70 minutes.